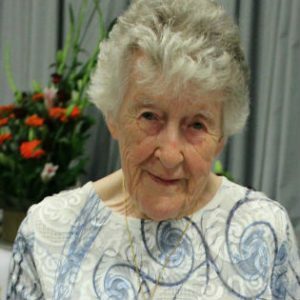 Sr Josephine Cannell is the oldest of the Sisters of Charity of Australia, celebrating her 101st birthday in February 2019. Her 100th birthday, which Sr Josephine marked at Masses and parties in Victoria and Tasmania, was anticipated for months and went on for weeks. See the story here and in Keep In Touch magazine here. Time perhaps for Sr Josephine to put the feet up, settle down for a well-earned rest after an astonishing life of teaching and writing? No, that’s not what happened. What happened was that six months ago, Sr Josephine had another thought about something to do – just don’t call it a project. In fact, don’t call it a lot of things – a memoir, a book, a story. 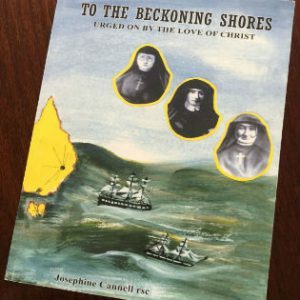 Sr Josephine is already a published author – To the Beckoning Shores: Urged on by the love of Christ, about the first three Sisters of Charity to arrive in her home State of Tasmania in 1847, so she knows what writing a book entails. 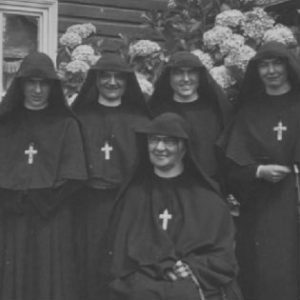 Given that only around 1,200 women have been Sisters of Charity in Australia, that gave Sr Josephine a unique perspective on her Sisters that no one will ever be able to have again. She had known, lived with, ministered with, more than half of the women who had been Sisters of Charity in total. That was the starting point for the memories she is capturing using a computer with a program to assist the sight-challenged and sounds every key stroke. “I type slowly, but when I make a mistake, the computer tells me,” Sr Josephine said. She is compiling her memories of the Sisters who have died for the Congregational Archives, not for general consumption. “Sometimes I write for half an hour a day, sometimes more,” said Sr Josephine. “Some days, I don’t do any.” Her progress was interrupted recently when the text vocalisation feature simply stopped working – “I keep on messing it up!” But she is back on track now and working away. Don’t be confused – even though she will be 101 in February, and her eyesight is not good, there is absolutely nothing wrong with her memory. It remains acute, and frequently commented on by those who saw her speak at her centenary birthday parties, completely ex tempore and precisely to the point. So how long will it take to finish the work on the Sisters? “Ten years,” said Sr Jo. “And I will not finish it.” And that was said firmly. So will there be a party to celebrate the 101st birthday? ” No party, said Sr Josephine. Again, firmly.